For the last five days, the bodies of the three slain militants, believed to be Pakistan nationals were lying in the mortuary of a hospital. Local Muslims of all cemeteries (in Kakryal area) strongly refused to give space to the militants in their graveyards or surrounding areas. As a result, their bodies were buried in an undisclosed location by the authorities to avoid confrontation. It is not the first time that local Muslims have not allowed burial of militants in their graveyards. Earlier bodies of terrorists involved in the Nagrota (November 2016) and Sunjwan (February 2018) terror attacks were also buried at undisclosed locations. “Muslims of Reasi district had declared that their cemeteries had no space for terrorists, who have no religion,” Tariq Bhat, ex-administrator of Auqaf, Reasi, told The Tribune. “The ideology of militants is against the tenets of Islam. They are not only enemies of Islam but of the whole of humanity,” added Bhat. He recalled that former Imam of Reasi had refused to perform “namaz-e-janaza” of two Pakistan Militants killed six years ago. This year, thirty-seven policemen, including eight SPOs, have been killed by militants so far – the highest police fatalities in twelve years. 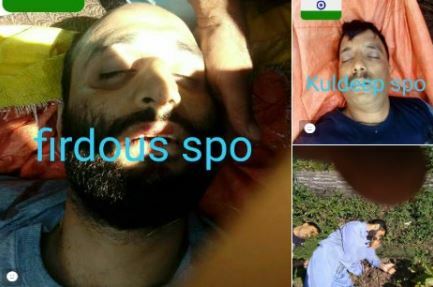 The Hizbul Mujahideen has been releasing pictures/videos of abducted and killed police personnel’s on social media. 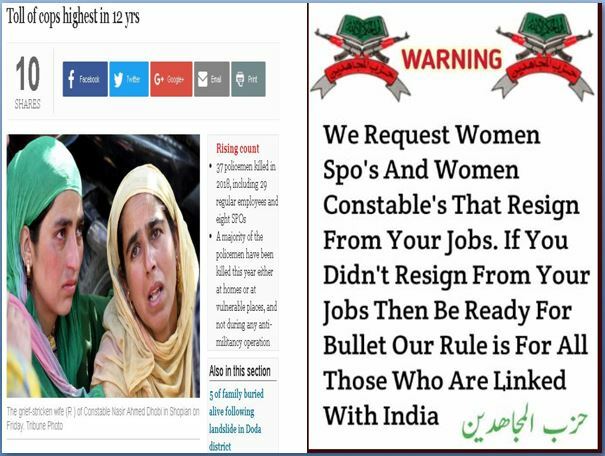 “There is no warning for you, will send you to hell.” In another post, the Hizb asked women constables and SPOs to resign too. 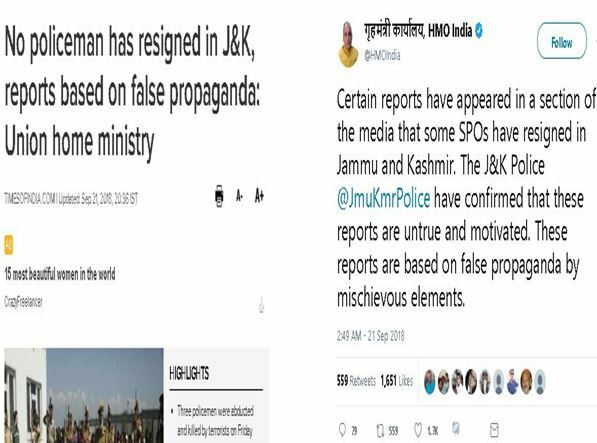 Following the killing, mischievous elements as part of false propaganda quickly circulated the fake news of resignation by 45 SPOs and two constables on social media. The Home Ministry, in turn, clarified that no policeman has resigned in the wake of the killings and these reports are “untrue and motivated”. If you want to attack SPOs do so when they are at duty. Don’t attack them when they are at home. This is a warning from the people of Kashmir. If these abductions and attacks at home continue HM will find the full wrath of Kashmir people against these injustices. Mend your ways. Kashmir was a place where peace and religious tolerance was the way of life. Today intolerance is being taught to the youths, instead of Kashmiri way of life with Sufism, Wahhabism is being taught with no tolerance for others. As a result, Kashmir has now become synonymous with turbulence. What India is facing in J&K is not just terrorism but a proxy war being waged by the deep state through the jihadi surrogates. The battlefield is now two dimensional with ISI handles flooding internet with doctored videos, fake news, and stories eulogizing militants, making them appear like heroes, crying foul trying hard to emotionally blackmail the affected community thereby disrupting effective counterterrorism operations. Kashmiriyat demands religious, social harmony and brotherhood. It is important that Kashmiris understand the nefarious designs of Pakistan and help themselves to bring back peace and prosperity. It may be noted that separatist forces including media are cashing on the Kashmiri blood being spilled. Security forces have shown utmost caution and patience to save Kashmiri lives. The rattled terrorist cadre could not digest the success of consistent efforts of security forces trying to persuade local militants to shun militancy and as a desperate measure, they then started targeting the local uniformed personnel at home. An act of cowardice which has exposed the ulterior motives of these self-styled saviors of Kashmir and pushed them further away from the hearts of Kashmiris. The local police work on the anti-militancy front with an eagerness that is why militants are targeting them. This is the murder of humanity and Kashmiriyat for which Pakistan is using Kashmiri people against each other. These incidents are a proof that militancy – jihad is not for Kashmiris because radicalized foreign local militants are now targeting Kashmiris since they are under tremendous pressure from across the border (ISI Pak Army) who want to engulf Kashmir in the same holocaust that engulfs Pakistan. A united & peaceful Kashmir is an eyesore for Pakistan, a fact which needs no further discussions. A country which has failed its own people repeatedly is on one foot to resolve Kashmir issue is laughable, to say the least. There seems to be a total conflict between what Pakistani people propose and what their caretakers dispose. Until they are on the same page of peace as desired by the majority of the Pakistanis, there is very little that can be done to save this ticking time bomb. All we Kashmiris can do is save ourselves from their malicious propaganda and reject jihad vehemently.